On Easter Sunday afternoon I joined the outreach team in the main park in front of the impressive cathedral, very close to the sea. 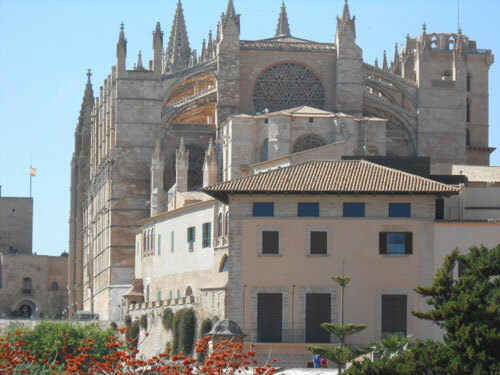 I took on the role of reaching out to the large number of German tourists who visit Majorca, as well as French and English speaking ones as they walked past, none of whom the Spanish church were able to communicate with. In amongst the inevitable rejections from the many who boasted of their atheism, there were hopefully some good seeds sown as well as precious encounters with believers from Sweden, Scotland and Korea, who relished the fellowship. It is so important to be proactive in bringing Christ to the attention of an all but totally secularised generation. It was precious to realise that we were reaching out for souls on what was once Ramon Lull’s patch. Lull is generally considered to be one of Majorca’s two best-known and most iconic characters, the other being Junipero Serra, the 18th century Franciscan who led missions to Mexico before his colonising work establishing missionary stations all the way from San Diego to San Francisco. Ramon Lull’s conversion was far from conventional. This hot blooded rake of a nobleman was about forty was pursuing a married woman in pursuit of pleasure. Unable to deflect his ardour in any other way, the lady exposed her breasts, revealing hideous a cancerous growth! The shock of this event made such a powerful impression on Lull that it, together with a series of five visions of the Cross, changed the direction of his life entirely. He became a serious philosopher, writing prolifically in Latin and Catalan, as well as learning Arabic, and encouraging others to learn it in order to reach the Arab world for Christ. He is credited with having established the written form of the Catalan language, which is now the predominant language in Majorca. 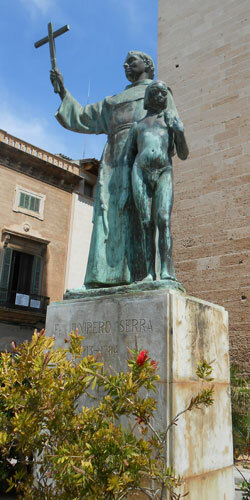 (See my article last summer on Majorca on linguistic and other historical details). I must confess to being grateful that the Lord me to a Spanish-speaking church! Lull set up a monastery, a newer form of which still stands atop the Puig de Randa. It was there that he wrote some 250 books and treatises on a wide variety of subjects. After that, he set up a monastic school for Oriental languages near Valdemossa, (the town Chopin claimed is the most beautiful in the world) and trained missionaries there for their work in Asia and Africa. I read one of his books many years ago: Holy Fools. Lull is best known outside the island for the evangelistic missions he conducted in North Africa, where he preached courageously. Claiming that Muslims can only be won for Christ by blood sweat and tears, rather than by the military crusades that had failed, he proved the truth of these words, being stoned to death by a mob in Algeria in 1315 whilst preaching the gospel at the advanced age of 80.